The high oxidation potential of ozone is utilized to its greatest advantage with highly efficient equipment developed by us. High ozone shock treatment by OZX-A3500 Ozone Blaster effectively removes stubborn odors from smoke, mold, and animal odors and decaying organics. It is useful to "blow out" an unoccupied room with a large amount of ozone to kill many of the odors and germs that may be present. This unit is a very compact in design but is a very powerful and enduring product. 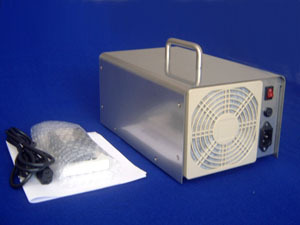 High ozone output with low power consumption ( about 100W). Long lasting performance with little maintenance. Notice: This product can be ONLY used for unoccupied ozone shock treatment! We do not have UK standard power plug. Users in the country with UK standards will get the product with standard EU power plug.